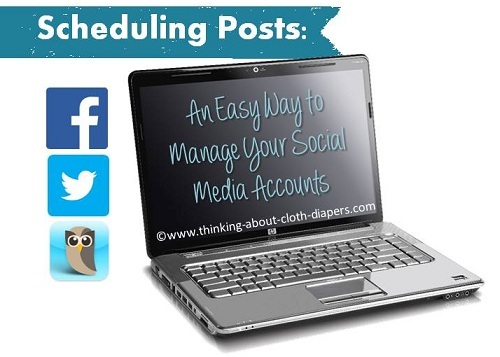 Scheduling posts in advance is an easy and effective way to simplify your on-line life - and make your social media presence more consistent! Read on to discover two great free scheduling tools! Running a blog or a business is a full-time business for most. Managing the social media needed to promote it can get downright hectic! But the more you leverage social media, the more your business can flourish! Luckily, there are tools that can simplify your social media presence, making it easy to set up posts in advance, so that they will show up in your feeds at the optimal times. Quite simply, to increase fan interaction by reaching a wider audience than you could with only one to two posts per day. As I increased my Facebook posts from one to two per day up to five to six per day (posting every 2 to 3 hours), I saw the weekly reach of my Facebook page more than double, and was able to engage 4 to 5 times as many Facebook fans. I also saw the referrals from Facebook back to my website increase - finally improving the return on my time investment into Facebook! Initially I worried that too many posts would turn people away from my page, but that simply hasn't happened. Probably because Facebook limits the number of people who see each post? Because each of my readers has more chances to see each of my posts, I am able to get at least 1,000 views, and sometimes much more (that's a fifth or more of my fans!) 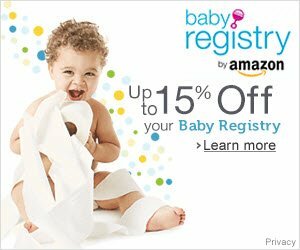 for sponsored posts, even when I include the link right in the post and tag the business! 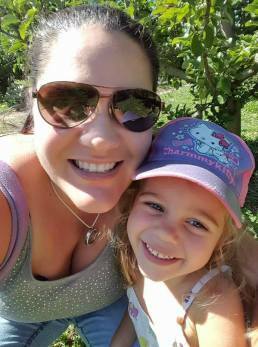 But, how to consistently post a half dozen times per day when I also work full-time and have a family life? That's where scheduling posts come in! If Facebook is your main (or only!) 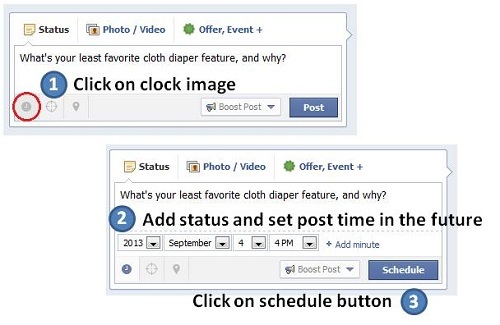 social media outlet, scheduling posts using the Facebook scheduler can be a lifesaver. Yes, you really can write your posts in advance! Whether you're going to be away from your computer or on vacation, you can schedule posts up to a year ahead of time. If I sign up to participate in a group giveaway, I use this tool to schedule my promotional posts in advance. Most giveaway hosts specify the number of times they expect you to promote a giveaway each week (usually two to three). With scheduled posts, I can be sure I meet the requirements - and space out my promotions to be sure I hit different times of the day and different days of the week throughout the giveaway period. 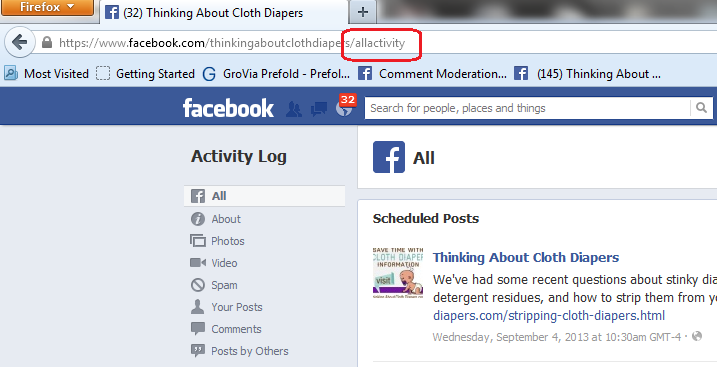 To check out your scheduled posts, you can type "/all activity" after your Facebook page's domain. Once you've scheduled a post, you can change the time of it, but you can't edit the post. If you wish to make changes, you'll need to delete and schedule a new one. Hootsuite is a social media management tool that makes it easy for you to interact with your followers and can be used to simplify - AND improve! - your social media presence! 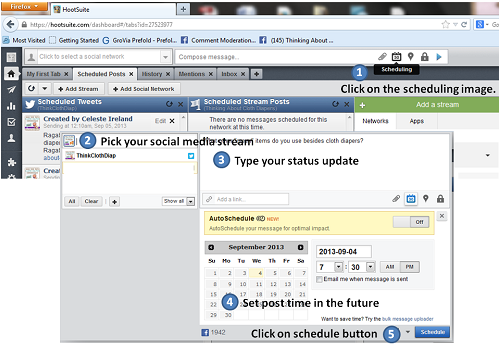 Hootsuite allows you to schedule posts with Facebook, Twitter, Google Plus and other social media outlets. Hootsuite's dashboard allows you to create several tabs so you can manage your social media profiles on a single screen. You can update your profiles and monitor comments and reader interactions easily for each of your networks. Hootsuite allows you to schedule your messages and updates in advance - you can even use their bulk uploader to schedule your posts from a CSV file. With a paid membership to Hootsuite, you can even input your RSS feeds to your postings, allowing you to continue to build traffic back to content on your site! Hootsuite also offers mobile apps for iPhone and Android. Using the mobile apps, you can access your tabs and streams, plus schedule posts and manage your profiles. Hootsuite offers a free account for small businesses which allows you to manage up to 5 social profiles (more than enough for most small business owners! ), and provides access to basic analytics and reporting. If you have a team that supports your social media efforts, or you manage multiple blogs and social media accounts, you can upgrade to Hootsuite Pro from $9.99 per month. The Pro version allows you to manage up to 50 social profiles and allows for advanced post scheduling and the addition of team members. With Pro, you also get Hootsuite University (training) options and improved customer service. And for big businesses, there is also an Enterprise version that provides customization and unlimited users. If search engine referrals make up a big part of your traffic today, you can build on it by leveraging your social networks. Scheduling posts in advance has made it easier for me to develop and maintain a more consistent social media presence, while reducing the overall time I spend on social media sites to only a few minutes of each day. When I first started out, I limited my social media accounts, knowing I didn't have time myself to manage more than one (and then two). Now that I've discovered an easier way to manage social media, I'm happy to say that increasing my social media presence has paid off big time for me in terms of reader engagement and traffic back to my website. Do you schedule your posts in advance? What tools do you already use to manage your social media presence?